Electronics! Metal! Screws! Resistors! Buzzers! Basic programming! Nostalgia! Review Back in the day of the board computers of the late 1970s - your Scrumpi, your Nascom 1, your UK-101 et al - it was customary to build a case for it out of wood. If you were a better equipped "constructor" - what we used to call "makers" in those days - you’d build a box out of metal. Folk like Tangerine offered optional cases, but most home micros made do with homemade jobs or nothing at all. Then along came the pre-knighthood Sir Clive Sinclair with his ZX80, and home micros had to be clad in plastic from then on. Skip forward 30-odd years and history is repeating itself. The Raspberry Pi is a board computer just like those 1970s offerings, only more powerful, more compact and with better programming facilities than the machine code monitors of yore. Some people even make their own cases, though there’s no shortage of plastic off-the-shelf offerings. And then there’s the Fuze, which takes Pi packaging to a whole new level of functionality - and of blast-from-the-past retro-styling. 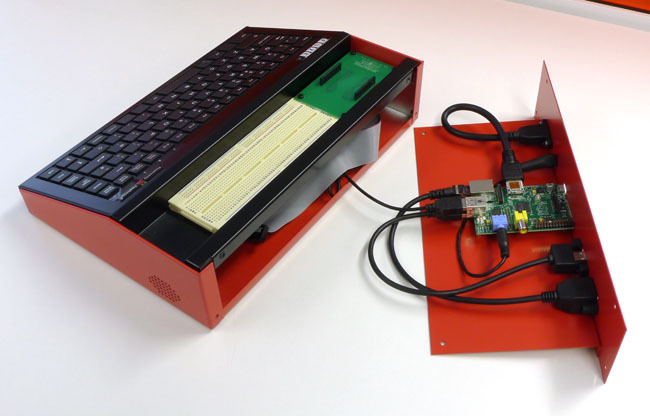 The Fuze is, quite simply, a large, keyboard-equipped case for the Pi that’s aimed less at kids learning to code - though it’s still perfect for that role too - than at hardware hackers who want to use the tiny computer as a microcontroller for electronics projects. The whole thing looks a late 1970s/early 1980s micro. It’s a large, metal box with full-size chiclet-style keyboard built in and mounted at an angle to give it more of a rake than most external keyboards are able to provide these days. Round the back is a line of ports, each accessed through a hole in the metal case and held tightly in place with a pair of cross-head screws. Two of them – the SD slot and a micro USB port – are those mounted on the Pi itself, but the rest – HDMI, 3.5mm audio, one full-size USB, and 10/100Mbps Ethernet – are separate connectors, linked up to the board by internal extension cables. 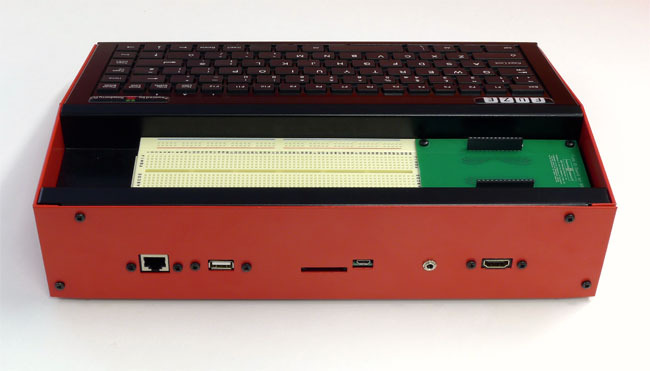 You’ll note there’s just a single USB port on the back, not because the Pi inside is a Model A, but because the Pi’s second USB port is connected to the keyboard. 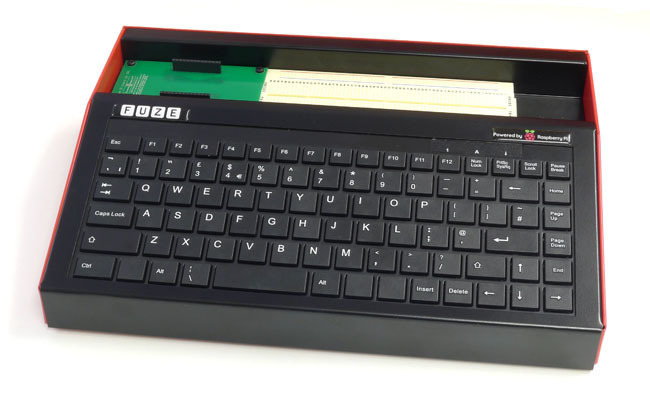 The case is constructed from a set of three folded and painted – in red and black, natch – steel plates: the base and sides; a rear panel with an interior tray to which the Pi is fixed; and an upper section with a gap for plastic keyboard. Four small, self-adhesive rubber feet stop the Fuze from sliding around. It’s reasonably well made. It could probably do with a couple more screws on the back to hold the upper sections together more tightly, and there are some exposed edges - not sharp, though - which aren’t very (young) child-friendly. That said, it’s sufficiently robust for a life in Bash Street, so it’s something of a no-brainer for teachers seeking a way of keeping Pis intact and safe from poking fingers. Above the keyboard is an inch-deep recess into which the Fuze’s creator, Binary Distribution, has fitted a GPIO breakout board comprising two, widely spaced female connectors ready for jumper wires, and a long plastic breadboard ready for your prototypes. Like one of those electronics project kits some of us as kids got for Christmas many years ago, the Fuze comes bundled with an plethora of resistors, coloured LED lamps, micro-switches, a buzzer and a single-character seven-segment LED display and jumper wires ready for connection. They’re all neatly placed in a small, multi-compartment plastic case.